LIMITED DEPARTURES - CALL 888-869-7907 Europeanbarging.com to book your 2019 or 2020 cruise. See more towns and villages of the Rhine and Mosel Rivers on this 11 night AmaWaterways Germany river cruise between Amsterdam and Basel. Barge and River Cruise specialist since 1998. Europe’s Rhine River is known as one of the most popular cruising paths. It is referred to as “Old Father Rhine” which offers breathtaking glimpses to castles, villages and vineyards. The spellbinding views bring a sensation of living in a fairytale and anticipating a meeting with the royalties. Embarking on a fairytale journey of a lifetime begins from Amsterdam, Netherlands to Basel, Switzerland. 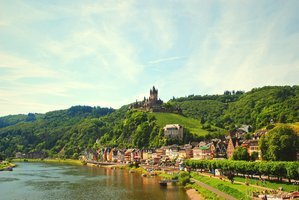 This river cruise itinerary will be passing through spectacular towns of Cochem, Strasbourg, Bernkastel and Riquewihr. Every town has its own colorful history and tales that will be a delight to know. Travel in style and comfort with AmaWaterways’ Rhine & Moselle Fairytales cruise package. It is an 11-night Germany River Cruise which provides luxury accommodation, world-class amenities, award-winning dining and a promise of extensive tour in every point of destination. With an 11-night cruise, you are able to visit more towns and see more than is usually possible on a 7 night river cruise. The cruise starts in Amsterdam and there is the option to explore more of Amsterdam with a 2 night pre cruise stay. Featured sites include a visit to Zaanse Schans, a city tour of Amsterdam, including a canal cruise thru the city. You will enjoy the sights of Skinny Bridge, the tall and narrow houses along the river banks, and the opportunity to take a glimpse of Anne Frank’s home. In Begijnhof, walk around the city and enjoy the Middle Age Era buildings. Afterwards, the cruise ship will be embarking outside Amsterdam and take you to the next destination of Cologne. Here you can enjoy a guided walking tour to visit the UNESCO designated and revered Gothic masterpiece Cologne Cathedral and the Old Town will be the day’s highlight. Enjoy beer tasting in Kölsch. Try Reibekuchen, a potato pancake with apple sauce. You can also join a bike ride tour and see Stadtgarten. Next stop Lahnstein, with the possibilities of discovering the rich history of Koblenz, located at the junction of the Rhine and Mosel Rivers. A guided day tour will bring you to Clock Tower, Monument of Emperor Wilhelm I and other cultural monuments. You can explore the place with the guided “Two Rivers Bike Tour” or ride a cable car to give you an aerial view of Ehrenbreitstein Fortress or a Castle Lahnstein hike. Heading onto the Mosel river, you come to the town of Cochem, with half-timbered homes and the Reichsburg Castle. Continuing along the Mosel river, is Trier, the oldest city of Germany where you can find the ancient Roman Amphitheater, the Basilica of Constantine and the Roman Baths. Unravel the secrets of Porta Nigra Gate. Listen to stories of barbarians and bishops which crossed the famous gate way back 180 A.D. For more active travelers, there is a Trier bike tour or a hike to point Petrisberg – located above the Roman Amphitheater amidst the vineyards. Heading back toward the Rhine River, the next stop is the cute town of Berkanstel – enjoy a day filled with wine-tasting activities because Moselle Valley is popular wine-producing region for over 500 years. Walking, cycling or hiking excursions are available to choose from. Back on the Rhine River, you come to the famous Loreley and the Rhine Gorge – a UNESCO designated area where breathtaking views of vineyards are located. At Rudesheim, take a gondola ride to Niederwalddenkmal Statue. Taste the town’s famed Rüdesheimer Coffee or explore Siegfried’s Mechanical Music Museum. Alternatively, enjoy a Schloss Johannisberg bike tour or a hike through the vineyards. The next stop of Ludwigshafen has so many options to enjoy in the area – a visit to Romantic Heidelberg Castle, a visit to one of the largest Baroque palaces – the Mannheim Baroque Palace (closed between March 4, 2019 to January 26, 2020 for remodeling). Mark Twain has written about it in one of his novels. Another option is a visit to the beautiful Schwetzingen Palace Gardens, or a Ladenburg bike tour or Heidelberg Philosopher’s Path hike – located on the northern side of the Neckar River – opposite of Heidelberg Castle. Continuing along the Rhine toward Basel, a stop at the charming city of Strasbourg, the capital of Alsace. The fairytale-like sights of “La Petite France” will captivate your senses. Other iconic structures are Place de la République, Parc de l’Orangerie and the European Parliament. Being on the border between France and Germany, there is a great combination of architecture that has a beautiful canal meandering thought the old town. The Strasbourg Cathedral of Notre Dame, offers it’s famous astronomical clock as well beautiful stained glass windows – the beautiful Rose window and some from the 13th and 14th centuries. Today it is the sixth-tallest church in the world and the highest surviving structure built entirely in the Middle Ages. The stop at Breisach has many options for touring. The Alsatian town of Riquewihr offers the enchanting sight of a medieval hamlet and other well-preserved architecture, looking like it did in the 16th century. Another option is the Black Forest town of Freiburg – home of the most beautiful spire on earth, as well as impressive stained glass windows – the Gothic cathedral known as Freiburg’s Münster. Those wishing a more active excursion can cycle through the scenic countryside, or go on a hike in the Black Forest, a magical land full of cultural traditions. Last stop – Basel Switzerland. After breakfast, your Germany River Cruise ends. If you have the time, AmaWaterways has put together a great little extension in Switzerland featuring the lovely cities – Lucerne, Vitznau and Zurich. Your excursions include a tour of Basel, followed by a bus transfer through the country between Basel and Lucerne, where your overnight. Excursions include a city tour and also you see the famous Lion Monument; another overnight then a scenic cruise from Lucerne to Vitznau on Lake Lucerne, followed by a transfer to Zurich where you overnight for 2 night and enjoy a tour of this international city. This cruise itinerary offers only a few departures each year, so call soon to check availability. Europeanbarging can assist with availability and check for promotions. 888-869-7907 Barge and River Cruise Specialist since 1998. This entry was posted in AmaWaterways, European Barging & River Cruises, General, Germany and tagged Amawaterways, deluxe river cruise, European River Cruise, Mosel River Cruise, Moselle River, Rhine River, River Cruises, Unesco World Heritage, Wine Tastings by Jan European Barging & River Cruises. Bookmark the permalink.